All dogs walk and jump and run, but dogs don’t fly. It can’t be done – can it? 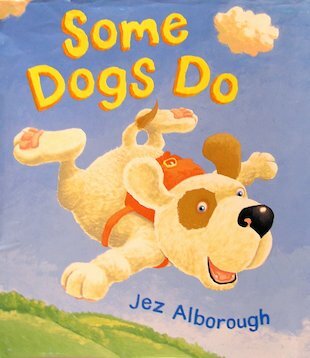 Jez Alborough’s uplifting tale is for anyone who has ever believed that miracles really do happen! With bouncy rhymes for reading aloud and brilliantly bold illustrations to grab young readers, this is a dream of a book with a positive can-do message. This is a funny book! Some dogs do…! WOW this book has got to be one of the best books in the world i love it.